Many photographers like to give nicknames to popular lenses. Sigma's marketing decided to preempt any attempts otherwise with the Sigma 105mm f/1.4 DG HSM Art Lens introduction, beginning this lens' section of the press release with "Introducing the 'bokeh master'", referring to this lens' capability of creating a high quality background blur and a strong amount of it. The 105mm focal length combined with the f/1.4 aperture plays a big role in making that attribute happen and the role this lens plays in a kit is often purposed around that ability, making a subject prominently stand out against a strongly blurred background. Though it has many other uses, photographing people is what this lens is exceptionally well-suited for. Also exceptional is this lens' image quality with excellent results delivered even at the ultra-wide f/1.4 aperture. The build quality of this lens at least matches the image quality and, especially with the uniquely-wide front element, this lens even looks amazing. Obviously, this is a prime lens with only a single focal length available. This makes focal length selection more important and "What is the 105mm focal length good for?" is the pertinent question. The standout use of the 105mm focal length is, as already hinted to, for portraits. The 85mm through 135mm focal length range (after FOVCF is factored in) is classically considered the ideal portrait focal length range, for reasons including perspective and working distance. A 105mm lens hits directly in the middle of that range on a full frame DSLR with the 168mm angle of view equivalent on an APS-C 1.6x body being a bit longer, but still great for portraiture, especially tightly-framed ones. An APS-C format DSLR of course requires a longer working distance to get the same framing as a full frame DSLR and therefore will have more depth of field and a less-strongly blurred background at the same aperture. While the perspective that 105mm provides is very slightly close for tightly framed head shots on a full frame DSLR, keeping back just slightly provides a great look. Being too far away is seldom a perspective problem (until communications fail), though features appear more compressed at longer distances, reducing the feeling of being close to the subject in the result. The young lady in the above image was standing just under a porch roof on a cloudy day, a great scenario for soft lighting. Notice the attractive perspective provided by this lens. 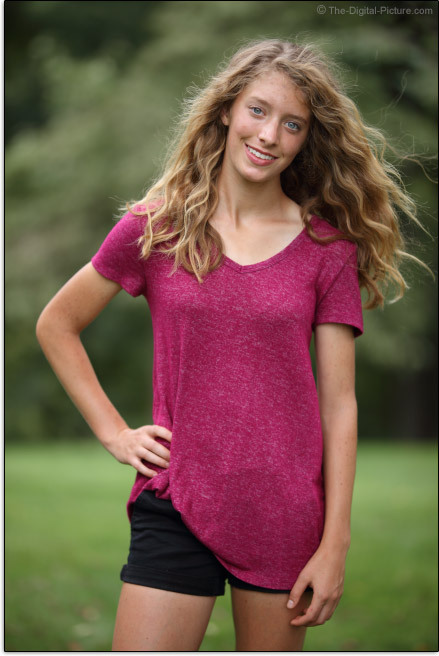 The "portrait photography" designation is a broad one that covers a wide variety of potential still and video subject framing (from full body to head shots) and a wide variety of potential venues (from indoors to outdoors). 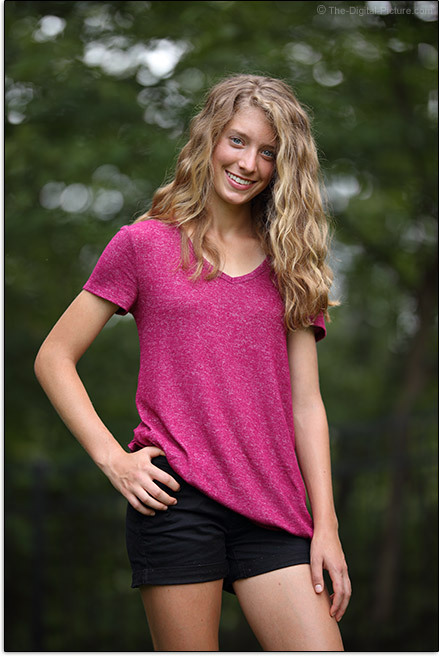 Portrait subjects can range from children to seniors and individuals to groups. Think engagements, weddings, parties, events, families, small groups, senior adults, fashion, documentary, lifestyle ... all are great uses for the 105mm focal length. There is often adequate space in even a small studio for portraiture with a 105mm-provided angle of view. 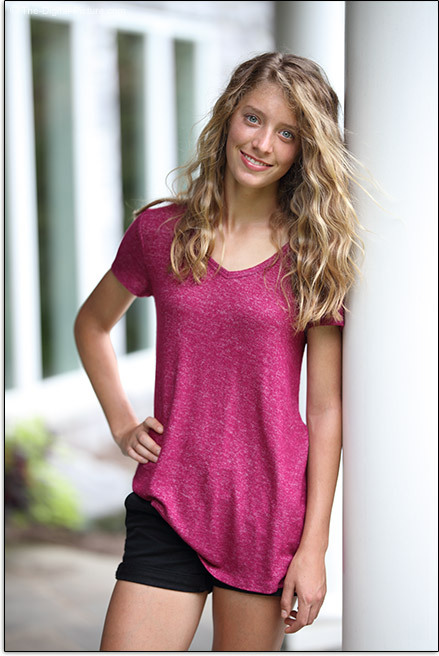 Entire portrait sessions can be done, inside or outside, with or without added light, with a wide aperture 105mm lens. I always contend that people are the most important subjects available. You can't buy stock photos of (most) people and that means portrait photography is one of the most-revenue-producing genres. Producing revenue of course makes a lens purchase much easier to justify. Regardless of the camera format being used, the 105mm focal length (like most others), can be used for landscape photography, though few will be interested in carrying the size and weight of this lens too far into the trail. Some sports, such as basketball, can be captured with a 105mm lens, and this lens can capture such events in very poorly-lit venues including gymnasiums. This focal length also works very well for products (medium through huge), commercial and general studio photography applications, some architecture needs and a wide range of other subjects. With only a few exceptions, the f/1.4 max aperture made available by this lens is as wide as DSLR lenses get (the Canon EF 85mm f/1.2L II USM Lens is one relevant exception). The basic concept is, the wider the aperture, the more light that is able to reach the imaging sensor. Allowing more light to reach the sensor permits a faster shutter speed to be used for freezing action including handholding the camera in lower light levels and/or the use of a lower, less noisy ISO setting. This wide aperture is especially valuable after the sun sets, in the shade and when shooting indoors, including indoors using only ambient light. One of my favorite features of a wide aperture lens is the shallow depth of field these can create. Increasing the opening reduces depth of field, creating a stronger, better subject-isolating background blur (at equivalent focal lengths). That is a very highly-desired lens capability, especially for a lens Sigma self-dubbed "Bokeh Master". The shallow f/1.4 depth of field must of course be acceptable to you for the scenario at hand, but shallow depth of field can make a subject pop from a blurred background. I can't get enough of the shallow DOF look that draws the viewer's attention to the subject by eliminating the background distractions. 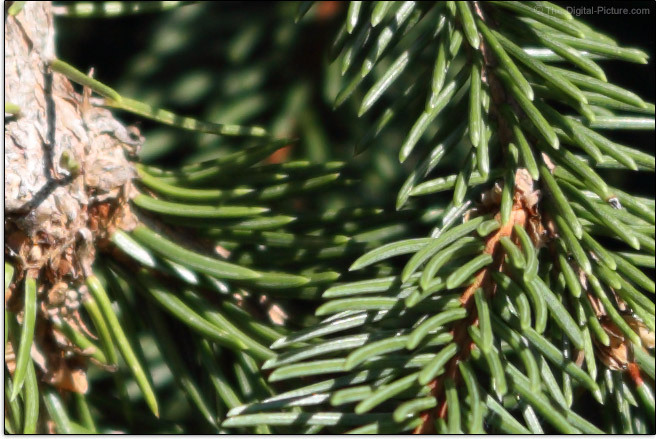 Here are two sets of aperture comparisons, illustrating the blur differences at different subject distances. 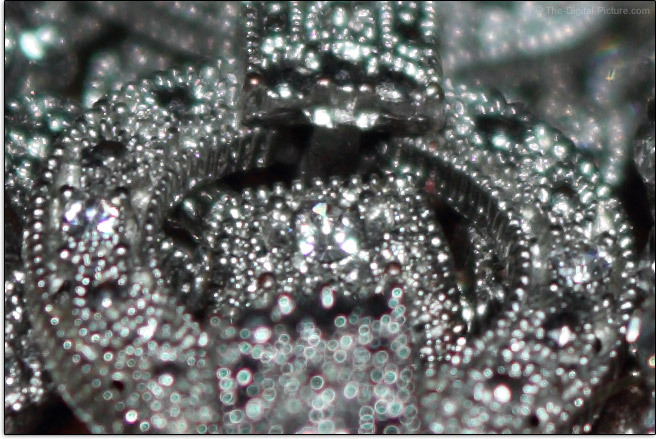 Note that the f/1.4 images were brightened by 1/3 stop to create a brightness more similar to the other samples. Why f/1.8 instead of the full stop f/2 in the first comparison? I apparently didn't click enough times to get to f/2. While 105mm is a telephoto focal length, it is not a very long telephoto focal length. Thus, when background blur considerations are important, the longer lenses often hold the background blur advantage. These longer lenses of course require more working distance and will produced more-compressed facial/body features. In the comparison above, look at the widest aperture you have available in a currently-owned 105mm lens (perhaps a zoom?). Then compare that result to the f/1.4 result. It is very likely that the difference is a big one with the wider aperture lens result strongly standing out in comparison. If your longest lens does not reach 105mm, the difference will be even bigger. Being able to strongly blur the background adds artistic-style imaging to this 105mm lens' capabilities list. The f/1.4 aperture is easily wide enough to enable the higher precision AF capabilities (most often the center AF point) in all cameras supporting this feature and it presents a brightest-possible viewfinder image. A wide aperture issue to note is that, especially under full sun conditions, even a 1/8000 shutter speed will not likely be fast enough to avoid blown highlights in f/1.4 images. The options are to use a neutral density filter to darken images or simply photographing with a narrower aperture remains an option. Or, find/create shade. An ultra-wide aperture always comes at a cost and, as usual, the cost includes a large diameter, a heavy weight and a moderately-high price tag. I always appreciate having image stabilization in a lens, including those with ultra-wide apertures, for the added stability it provides. This lens does not offer that feature. Having an ultra-wide aperture is great, but just because a lens has an ultra-wide aperture does not mean you want to use that setting. Having sharp image quality at that wide aperture is not always guaranteed and plenty of f/1.4 lenses leave us wanting at their wide open apertures. Sigma has been impressing with its Art lenses, including with the next-widest-f/1.4 option, the Sigma 85mm f/1.4 DG HSM Art Lens, and the 105 f/1.4 Art lens again impresses. At f/1.4, this lens delivers very good image sharpnes, showing very little degradation into full frame imaging sensor corners. These results are among the best available from any lens at f/1.4. Stop down to f/2 and the center through mid-frame turns razor sharp. Stop down to f/2.8 and the extreme full frame corners do the same. In addition to our standard lab tests, I like to share some real world examples. The images below are 100% resolution crops from images captured in RAW format using a Canon EOS 5Ds R. The images were processed in DPP using the Standard Picture Style with sharpness set to "1" (very low). Note that even modestly-high sharpness settings are destructive to image details and hide the true characteristics of a lens (and all cameras are set to oversharpen results at their default settings). These examples are from the center of the frame. Find the sharpest area in each sample to find the center of the plane of sharp focus. The results at f/1.4 are nice, especially considering the low amount of sharpening applied (try adding you own sharpening routine to these) and the f/2 results are excellent. Note that while the subject remains in focus and some increase in foreground focus is achieved by stopping down, much of the depth of field increase comes behind the focused-on subject. The focus shift is not too bad, but it is there. If you want to see a lens at its worst, look at the extreme corners where the light is most strongly diffracted. Following are 100% crops taken from the top left corner with the exception of the last set being from the bottom left corner. Especially for an f/1.4 aperture, these corners look great. Sharpness increases at f/2 and at f/2.8, and these results are very impressive. When used on cameras with imaging sensors taking full advantage of the image circle provided, light falloff can be expected in the wide aperture corners. In this case, about 2 stops of shading is seen. This is a noticeable amount, but not a relatively strong amount. Only about a stop of shading (typically barely noticeable) remains in f/2 corners and seldom-noticed will be the .4 stops at f/2.8. Very little additional change is noticed through the narrower apertures. APS-C format camera owners will see very little peripheral shading, even at f/1.4. While lateral CA is usually easily corrected with software (often in the camera) by radially shifting the colors to coincide, it is of course better to not have this defect in the first place. 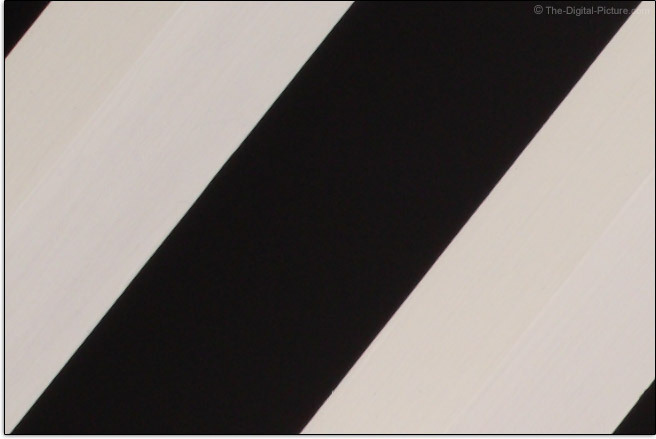 Any color misalignment present can easily be seen in the site's image quality tool, but let's also look at a worst-case example, a 100% crop from the extreme top left corner of an ultra-high resolution 5Ds R frame. As prime lenses only have a single focal length to be designed for, lateral CA is typically low in these lenses and that is the case here. There should be only black and white colors in this image and that is essentially what we see. Following are three 100% crop samples captured at 1-stop aperture increments. The peripheral color of the out of focus specular highlights being different in the foreground than in the background readily highlights some of these issues, but the difference in this case is not strong at all. We have already established that this lens becomes sharper as it is stopped down to f/2 and spherical aberration, primarily seen at f/1.4, clears to improve the center of the frame sharpness at f/2. This set of examples also illustrates the focus shift I referred to earlier in the review. Put the sun in the corner of the frame of a wide aperture telephoto lens, stop down the aperture and strong flare effects are normally expected. 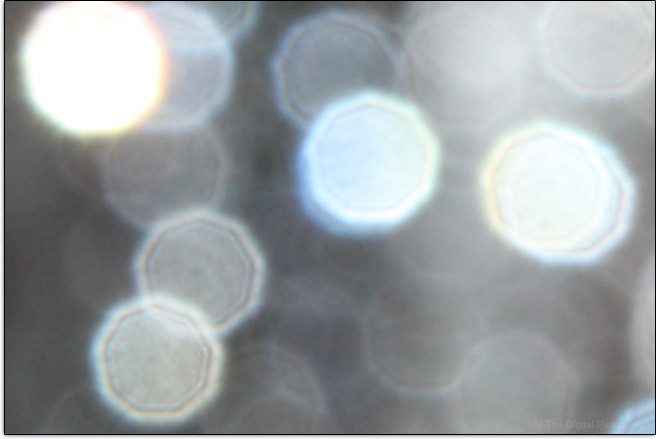 This lens is not flare effect-free, but aided by Super Multi-Layer Coating, the amount is not comparatively strong. 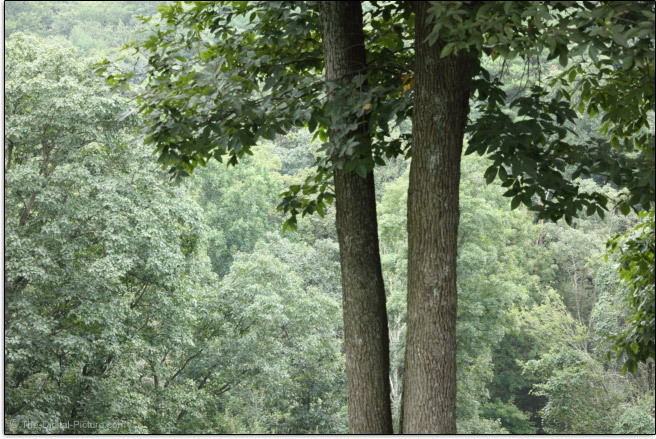 Below is a 100% crop taken from the top left corner of a 5Ds R frame. 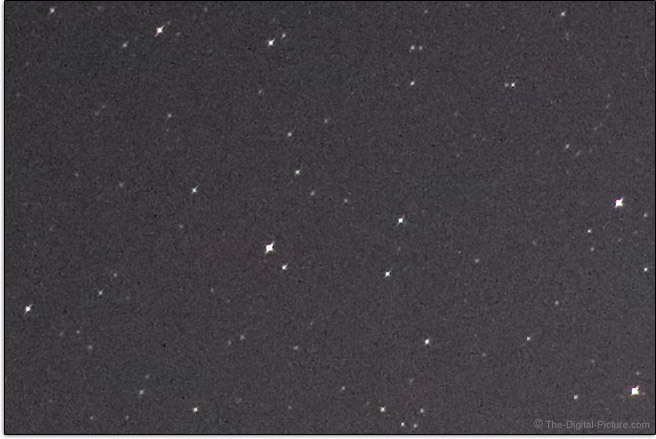 No equatorial mount was used, but Polaris, the north star, being in the frame means the stars are not crossing pixels on the imaging sensor very quickly and the f/1.4 aperture is letting a huge amount of light into the exposure. That the stars are not perfect circles indicates some issues, but things are not falling apart here. With only one focal length to optimize for, lens designers often create prime lens designs with very low amounts of geometric distortion and this one looks excellent in that regard. Let your straight lines fall along the edge of the frame if desired as this lens will keep them straight. There is no need for highly destructive distortion correction to be applied to Sigma 105mm f/1.4 DG HSM Art Lens images. As it is the "Bokeh Master", a look at the bokeh, the quality of the foreground and background blur, seems especially relevant for this review. Here are some examples. For an f/1.4 lens, f/8 is very stopped down and the aperture blades are strongly interacting with the results. In the out of focus highlights example, the shapes are staying nicely rounded with smooth centers and a relatively quite low amount concentric ring visibility at the border. 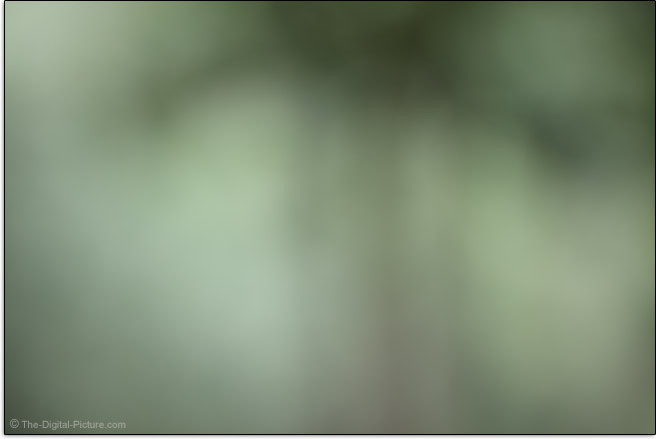 Outside at f/8 (the sample is a full image reduced), this blur appears relatively smooth. At f/1.4, the cats eye bokeh, a form of mechanical vignetting, can be seen in the corners, though the amount is relatively low. Overall, this lens has very nice bokeh, but that this lens can produce an extremely strong background blur is going to be found even more important to most. As illustrated throughout this review, this lens can turn the busiest background into a smooth blur of color if some space is provided. With a 9-blade (rounded) aperture, this lens creates 18-point stars from point light sources captured at narrow apertures. While this lens creates rather strong star effects, each point is somewhat flared apart as shown below. 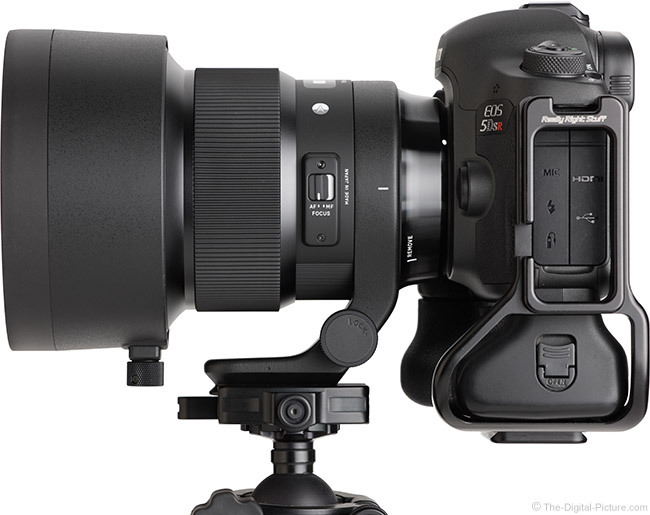 Overall, Sigma 105mm f/1.4 DG HSM Art Lens scores very high in the image quality category. Results are not perfectly sharp at f/1.4, but again, there are very few lenses that compare to this one at f/1.4 and I have not hesitated to use this aperture for my needs. Stop down to f/2 for really impressive results. This lens aces many of the other image quality categories. As with the rest of the Art lenses introduced to date, the 105mm f/1.4 Art Lens features Sigma's HSM (Hypersonic Motor) driving AF. Short distance focus adjustments happen with decent speed, though the wait for long distance adjustments is more noticeable and you'll not likely categorize this lens as focusing "fast". Especially in lower light levels, some minor autofocus distance adjustments are often made after the initial focus acquisition, increasing the overall AF lock times of even shorter distance adjustments. While this lens may not be the fastest-focusing model available today, it focuses fast enough to be adequate for most intended uses. This is a quiet-focusing lens. Even in a low-noise environment, only a quiet shuffling ("shhhh") and some clicks are heard during focusing. Focusing is internal and FTM (Full Time Manual) focusing is supported. With an ultra-wide telephoto lens being able to produce very shallow depth of field, AF system accuracy takes on increased importance – far more importance than autofocus speed for most of us. A mis-focused image usually heads straight to the trash can and AF accuracy performance testing is always a high priority for me. This is where testing sometimes gets very complicated as there are an infinite combination of testing scenarios and it is totally unrealistic to test even most of those. Does the Sigma 105mm f/1.4 DG HSM Art Lens focus accurately? What I learned from about 1,000 AF-captured images is that in some situations, the results were extremely good with nearly every image properly focused and in other situations, there was a lot of inconsistency. My Canon EOS-1D X Mark II produces a very solid accuracy rate. The peripheral AF points were just slightly less consistent and one scenario showed not all focusing to the same calibration, but overall, the results were quite good. On the other hand is one of my 5Ds R bodies. Let's look at a set of consistency examples. Each image was captured with the lens slightly defocused. 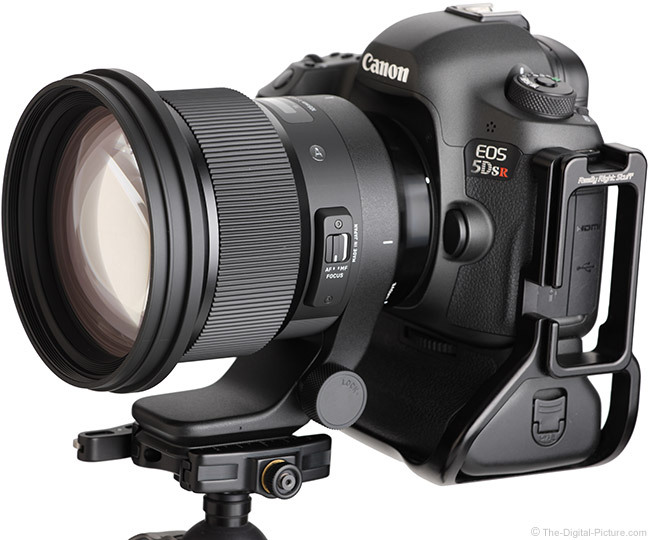 A tripod-mounted EOS 5Ds R was behind the lens. I'm not looking for sharpness in these test results, but I want all images to appear similar, showing good consistency. The selected AF point shown is the third from the right, second row from the bottom (these are screen grabs from Canon Digital Photo Professional's Quick Check with the low-contrast Neutral Picture Style selected). 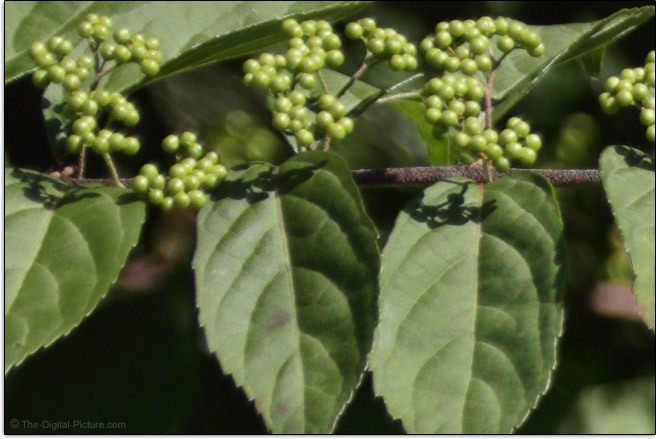 These are the first 10 images for this focus point test. The next 10 images in this test appeared similar and these results are not greatly different from some of the other tests (not an outlier result set). With the 5Ds R, images captured using the center AF point were slightly more consistently accurately focused than those captured using peripheral AF points. However, when shooting portraits, it is especially common to use peripheral AF points and when depth of field is shallow at tighter portrait distances, recomposing can cause depth of field to move forward or backward. In a long portrait session, all shots of a few poses were mis-focused while in others situations, all or nearly all images were properly focused for a decent overall focus accuracy rate of about 90%. The key with this lens is to learn how it performs with your own camera (it could be different than those I tested with) and frequently check results (you should be doing this anyway). Re-shoot those scenarios showing issues. Note that AF inconsistency is not easily resolved through calibration. Those using sensor-based AF systems, including Canon's Dual Pixel AF, will likely find this lens' AF accuracy to be consistently excellent. AI Servo (continuous focus) mode, with the camera predicting the subject distance precisely at shutter release will always challenge an AF system. With a Canon EOS-1D X Mark II behind the Sigma 105 f/1.4 Art Lens, results were reasonable. Interestingly, there were nearly as many longer-distance results mis-focused as close results, even though the rate of closing is much higher and depth of field much shallower at close distances. Remember that when photographing close to the minimum focus distance such as for head shots, this lens has extremely shallow depth of field. 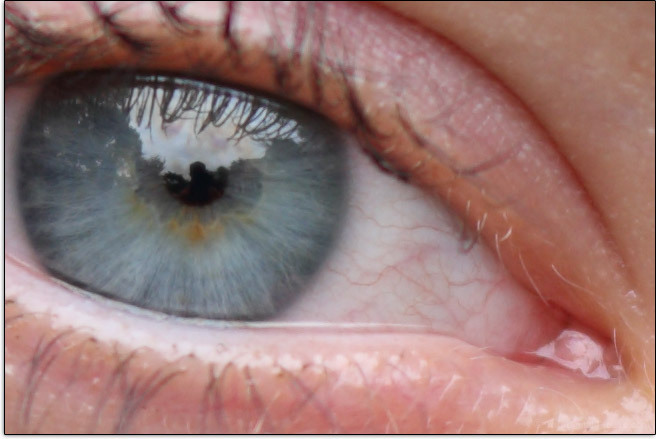 So shallow that even the eyelashes are modestly out of focus if the iris is in sharp focus or vice versa. I point this out now because, if handholding this lens for tightly-framed portraits, neither you nor the subject are perfectly motionless. And, you may focus on the eye, but the camera gets to determine if the eyelashes or the iris are the subject, adding some additional variability. Both you and the subject should probably then hold your breath because even the little bit of movement that activity causes can take precise focus off of your subject's eye. My advice is to not avoid, but seek out these shots because they look awesome. However, you might want take multiple photos to ensure that you get the one you want. Of course, if the subject's face isn't square to the camera, the other eye will be out of focus. If that position is still desired, focus on the closer eye and don't worry about the sharpness of the other. As illustrated earlier, this lens has a small amount of focus shift rearward as it is stopped down. Most will not find the amount to be a problem and, of course, there is no shift at f/1.4. As referenced, focus calibration is also a key to accurate focusing and compatibility with the Sigma Dock (more later) ensures that this issue, if it were to exist, can be easily resolved. Cameras with the autofocus microadjustment feature also have the ability to adjust calibration in-camera. As illustrated above, when this lens' focus distances are changed significantly, subjects change size a modest amount (this accounts for the positioning changes in the focus consistency test). Sigma provides a small depth of field scale on the focus distance window of this lens, though f/16 marks are the only ones provided. The Sigma 105mm f/1.4 DG HSM Art Lens' manual focus ring is superb. The 2.04" (51.9mm) ring is very large, including the back side of the widest portion of the lens which increases manual focusing comfort by reducing the friction that would otherwise be present at that position. Although very wide in the hand, the strongly-rubber-ribbed focus ring is extremely smooth, has ideal resistance and has no play. The 154° of rotation is ideal for precise manual focusing over the entire focus distance range. 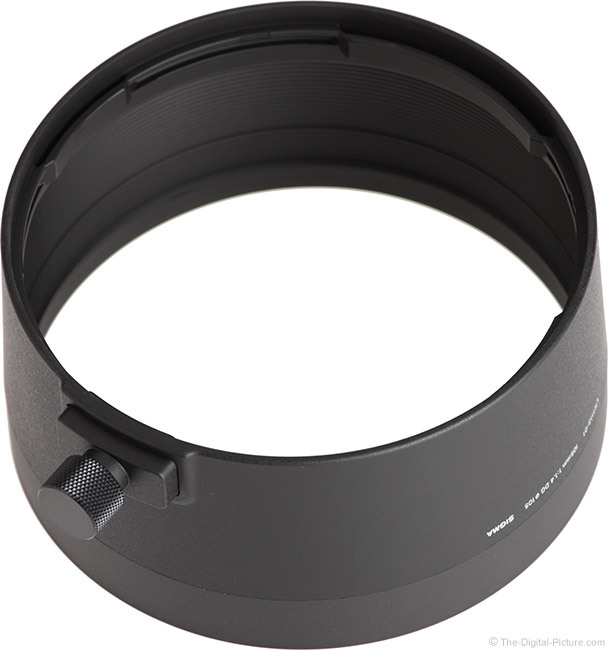 This focus ring adjusts distance in the same direction as Canon and Sony lenses, the opposite direction of Nikon lenses. Focus rings on average have become much better over the last decade, but I've used some lesser manual focus rings recently and those serve to make this one seem especially great. Ultra-wide aperture prime lenses seldom have remarkable minimum focus distances or maximum magnification specs and that is the case with this lens. The 39.4" (1000mm) close focusing distance generates a normal-for-the-class 0.12x magnification. Here is a table showing the close focusing specs for many lenses in this general class. As this lens will be most-used for portraits, I'll share a portrait captured at (or very close to) this lens minimum focus distance. The perspective is slightly close, but ... that background is completely gone. I love it. Magnification from short telephoto focal length lenses can be modestly increased with the use of extension tubes which are basically as their name implies, hollow tubes (with electronic connections) that shift a lens farther from the camera. Doing so allows the lens to focus at closer distances, though at the expense of long distance focusing. The Sigma 105mm f/1.4 DG HSM Art Lens is not compatible with Sigma teleconverters – they do not physically fit into the back of the lens due to clearance issues with the rear lens elements. With a strong resemblance showing throughout the line, Sigma's Global Vision series Art lenses all have a classy modern styling, visually featuring various reflectivity levels of black finish. The 105 Art's exterior features quality Thermally Stable Composite material construction with metal used for the glossy black mount end and of course liberally utilized internally. This barrel has very obvious diameter changes with the big one being at the end where this lens grows very substantially. The sharply-ribbed focus ring feels great and a 180° section of the barrel is mold-ribbed to facilitate grip. 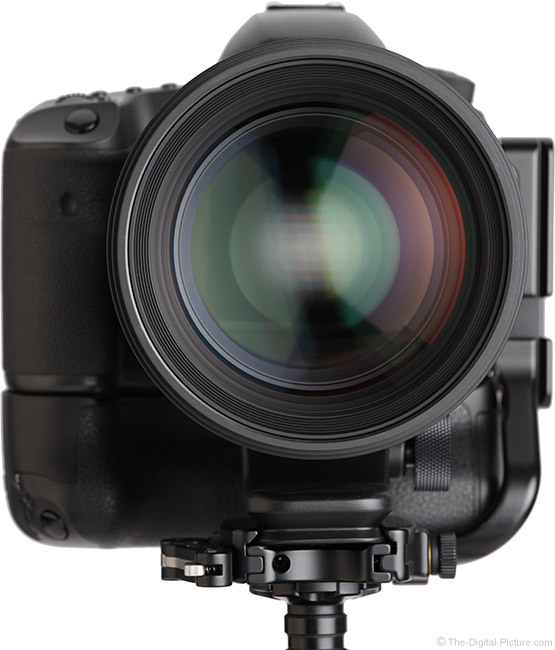 The AF/MF switch, like the rest of the Art lenses, has a white background indicator when in the AF position. The switch is easy to find on its raised switch bank and it is firm with a strong click into position. This lens has some weather sealing, including a rear gasket seal as seen below. 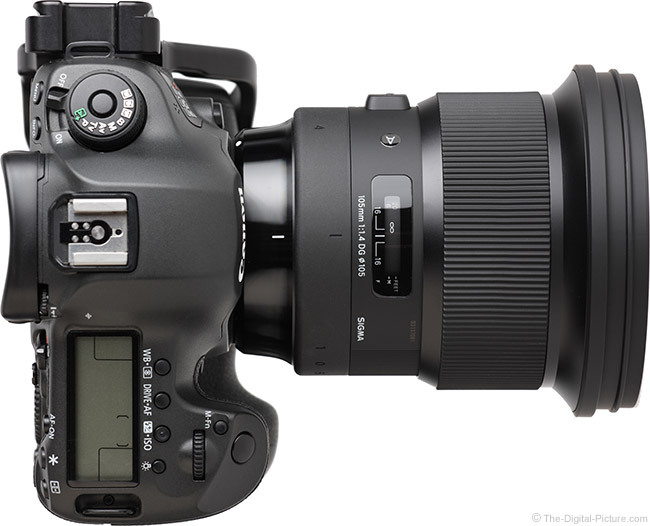 The Sigma 105mm f/1.4 DG HSM Art Lens seems very well constructed and its size and weight aid in that perception. In the latter two categories, this lens is class chart-topping. For many more comparisons, review the complete Sigma 105mm f/1.4 DG HSM Art Lens Specifications using the site's Lens Spec tool. No other lens on this list is as wide, as long or as heavy as this one. However, much of the width is due to the large diameter of the objective end and without that, it is not much different in size than the 85 f/1.4 Art lens. The weight increase from that lens is rather noticeable and you will feel that, but keep in mind that Sigma included the 4.4 oz (125g) tripod ring in their weight spec. Remove the tripod ring and this lens decreases in size and weight a noticeable amount. While it is a heavy lens, this is not a super telephoto lens and it can easily be handheld for reasonable lengths of time. I shot the 105 Art handheld for over an hour without difficulty. Let's review some visual comparisons. First up are comparisons with 85mm f/1.4 lenses from, left to right, Nikon, Sony, Canon and Sigma. The Sigma 105 is of course on the right. The same lenses are shown below with their hoods in place. Also relevant are comparisons with 100-135mm ultra-wide aperture prime lenses. 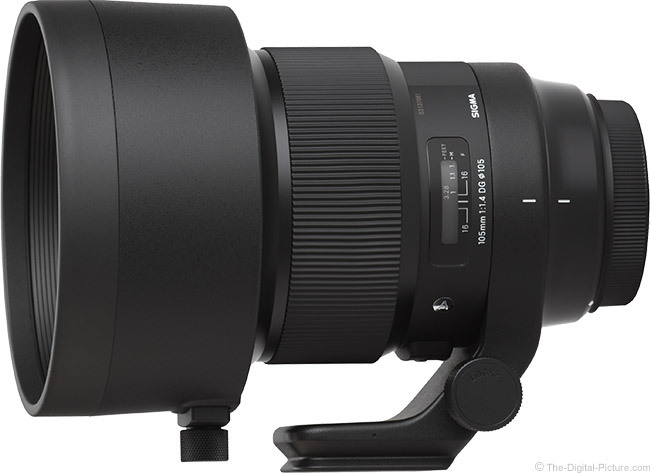 Use the site's product image comparison tool to visually compare the Sigma 105mm f/1.4 DG HSM Art Lens to other lenses. 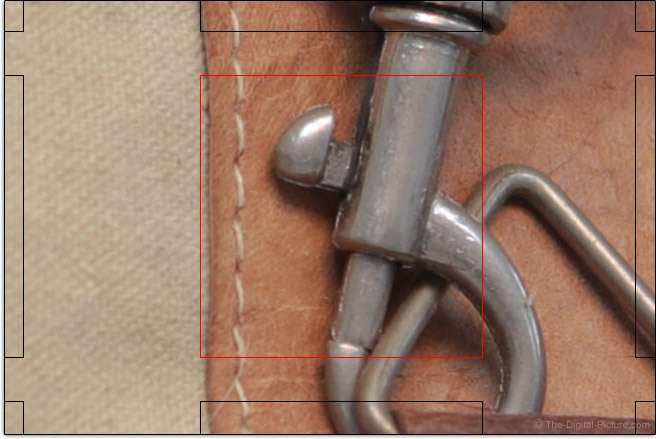 Note that the comparison tool crops the lens' tripod foot and some of the hood's metal thumbscrew lock; at the time the tool was created, non-super telephoto lenses this size didn't exist. As I mentioned in the Sigma 85mm f/1.4 DG HSM Art Lens review, a lens of this size and weight is going to make a tripod-mounted camera setup challenging with sag being very likely. Inclusion of a tripod ring takes care of that problem. Remove the tripod ring and this lens will appear considerably smaller in the comparisons. This is a split-ring (not hinged) design that loosens and slides rearward via slots accommodating the round metal guides for removal. In use, this flush-mount tripod ring is comfortable and very substantial in strength and rigidity. The forward-sloping foot avoids contact with the grip fingers when the ring is rotated into that position, likely when it needs to be moved out of the way. 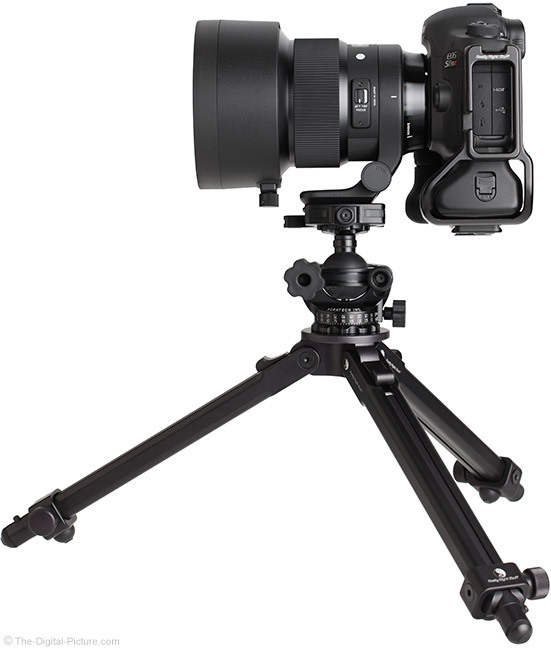 That forward shift of the foot means that the balance with most cameras is behind the mount position. That issue doesn't seem significant in use. When using tripod ring-equipped lenses on monopods, I like to hold my left hand over the foot for primary camera control. The finger clearance on this one is tight. The strongly-knurled locking knob is very adequately-sized and easy to roll between fingers. The ring rotates with good smoothness, except when the guides and slots are meeting. 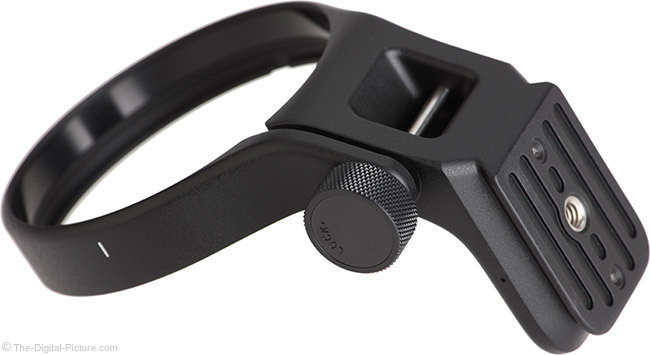 I love that Sigma has provided an integrated Arca-Swiss dovetail for quick mounting to a wide range of clamps. That saves me the cost and weight of adding my own plate. However, this design is just slightly different from my RRS, Kirk and Wimberley plates. One of my older Really Right Stuff Lever-Release Clamps will not lock down on this foot and not as much force is required to close the newer clamps I have. Always test your gear before using it for something important. I'm telling myself this as I was set up to photograph the sun setting over a lake deep in the North Maine Woods. I arrived a bit late and set up a big lens on one tripod (to capture silhouettes of a fire tower). I had the other tripod set up just in time, but as I went to mount this lens on the UniqBall UBH 45X Ball Head, I realized that the Sigma integrated foot was not long enough to engage the jaws of this two-directional clamp. I missed some of the best sky color as I scrambled to set up a different camera and lens. A pin in the rear of the tripod ring accommodates a provided neck strap. If you are not going to use any of the benefits of the tripod ring, it is best to remove it, saving the weight and space it consumes. 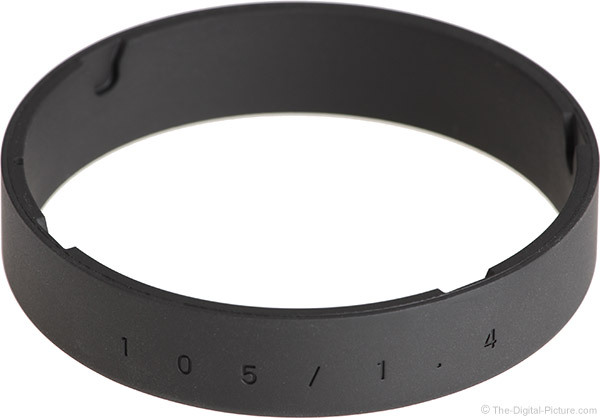 And in that case, Sigma provides a firm silicone band that fills the tripod ring void on the lens barrel. The ring fits tightly and must be carefully aligned in the guides, but once installed, the lens is very comfortable to use. That this lens can utilize threaded filters is great. That they must be a focal-length-matching 105mm in diameter is not as great. These filters are huge and expensive. 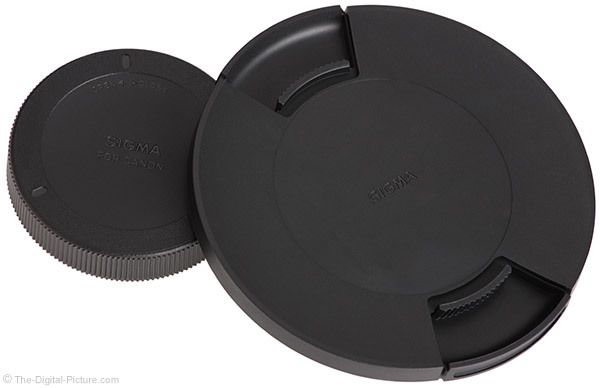 Equally huge are the LCF-105 III lens caps, but very positive is that Sigma has a great, easy-to-grasp design. The included semi-rigid, round Sigma LH1113-01 lens hood is constructed of carbon fiber reinforced plastic and features a quality metal thumbscrew lock for easy mounting. The end of the hood is rubberized for non-slip and non-scratch functionality and the interior is ribbed to avoid reflections. The hood offers the huge front lens element good protection from light and from impact. 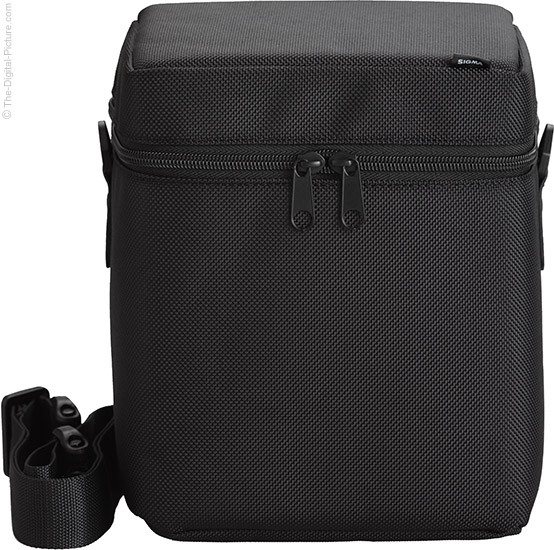 Sigma Art lenses come in a nicely padded, double-zippered case. 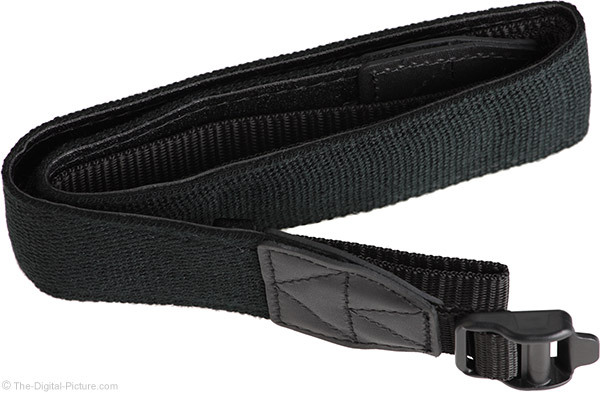 A shoulder strap is provided, but a belt loop is not. It would be impractical to have this big case hanging from a belt anyway. 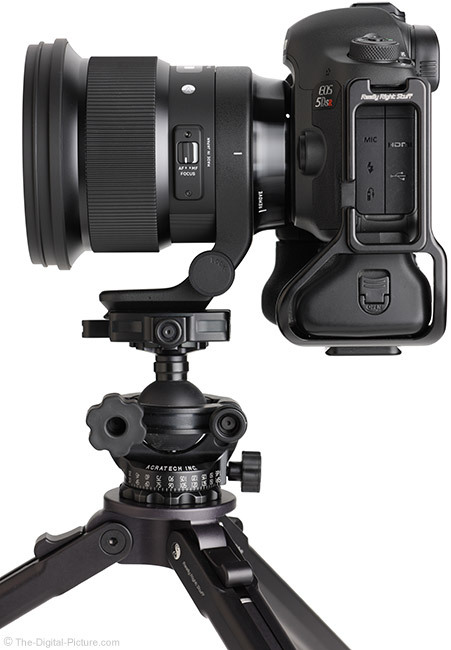 Sigma has been introducing some very nice lenses in the Global Vision series, but I have never been a fan of the narrow categorization structure. This of course is an "Art" lens and as such, gets an "A" stamped in a classy chrome circle on the lens barrel (and it looks like a work of art). Don't limit this lens' use to its letter designation. A great feature of the Global Vision lenses is compatibility with the Sigma Dock. 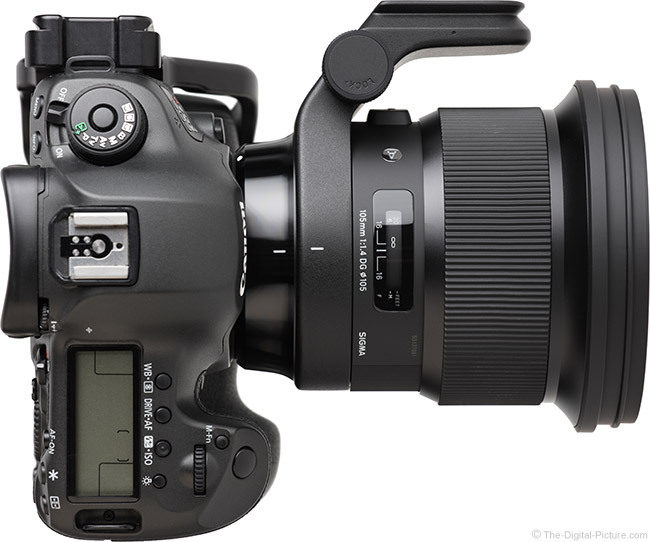 The dock, working in conjunction with the Sigma Optimization Pro software, allows the lens' firmware to be updated (bug fixes, compatibility updates, feature enhancements, etc.) and allows precise autofocus calibration at four distances. FTM focusing can also be disabled/controlled via the dock. Here are some screen captures showing some of the functionality. The focus calibration values were set for illustration purposes only. Sigma Art lenses are all about great value. They all provide quality construction, good performance and excellent optical quality for a moderate price, a price well below the Canon, Nikon and Sony equivalents – when those equivalents are available. As of review time, only Nikon makes the equivalent lens and that one carries a substantially higher price tag. The Sigma 105mm f/1.4 DG HSM Art Lens is available in Canon EF (reviewed), Nikon F, Sony E and Sigma SA mounts and the Canon and Sigma versions can be adapted for use on a Sony E-mount camera body via the Sigma Mount Converter MC-11. This lens will likely qualify for Sigma's Mount Conversion Service in case you later change your mind. My standard disclaimer: There are potential issues with third party lenses. 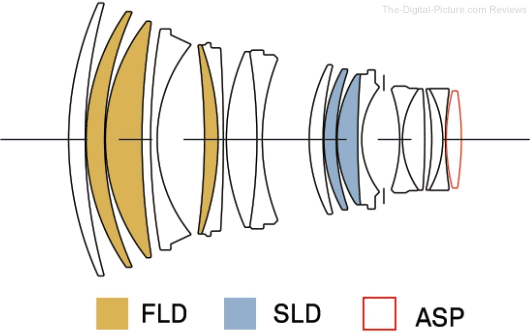 Since Sigma reverse engineers (vs. licenses) manufacturer electronics and algorithms, there is always the potential that a DSLR body might not support a (likely older) third party lens. Usually a lens can be made compatible by the manufacturer via a firmware update, but this cannot be guaranteed. 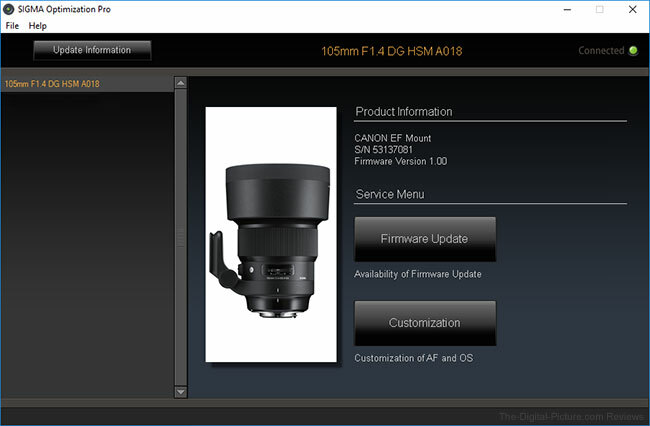 Compatibility with the Sigma USB Dock is risk reducing as Sigma can make dock-compatible lens firmware updates available for download. Sigma USA provides a 1-year limited warranty with a 3-year warranty extension (Sigma's international limited warranty is 1 year). 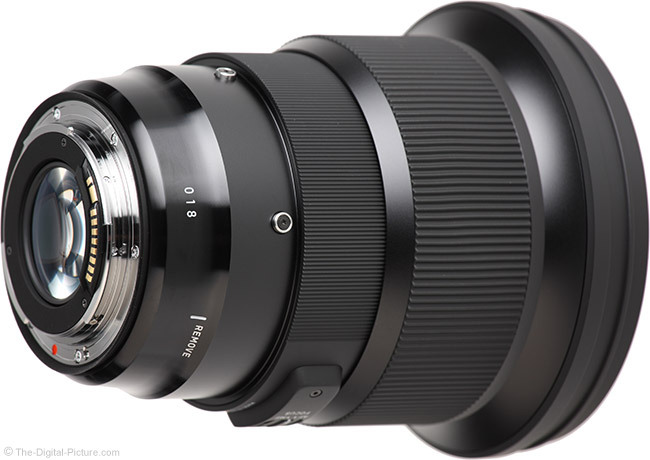 The reviewed Sigma 105mm f/1.4 DG HSM Art Lens was online-retail sourced. While the comparison tables I shared earlier in the review were long, there is currently only one other lens with the identical focal length and aperture specs. That is the Nikon 105mm f/1.4E ED AF-S Lens. In the Sigma vs. Nikon image quality comparison at f/1.4, I see the Sigma turning in slightly better center and mid-frame performance with the two being similar in the corners. The Sigma appears to hold a slight edge even when stopped down a stop or two. The Nikon appears to have a very slight amount of pincushion distortion. Looking at the specs and measurements, the Sigma 105mm f/1.4 DG HSM Art Lens vs. Nikon 105mm f/1.4E ED AF-S Lens comparison shows the Nikon to be a very considerably smaller and lighter (34.8 vs. 57.9 oz, 985 vs. 1640g). Of course, weighing less, the Nikon does not necessarily need a tripod ring and does not have one available (the Sigma lightens up to 53.7 oz (1520g) without its ring). Along with having a smaller physical size, the Nikon utilizes a significantly smaller filter diameter, 82mm vs. 105mm. The Sigma provides a bit more focus ring rotation, 154° vs. 128°. The price tags will be the decision maker for many as the Sigma is considerably less expensive. Should I get the Sigma 85mm or 105mm f/1.4 DG HSM Art Lens? That is a very relevant question as these two lenses are rather similar with similar purposes. Yes, the additional 20mm of focal length makes a difference in the perspective provided for identical framing. For a 47.25" x 31.5" subject, the 105mm lens requires 11.61' vs. 9.5' for the 85mm lens. That is a 1200mm x 800mm subject framed at 3540mm vs. 2897mm for the 105mm and 85mm focal lengths respectively. Via magnification, the 105mm lens will create a stronger background blur with identical subject framing. Have fun with the Sigma 105mm vs. 85mm f/1.4 Art Lens image quality comparison. At f/1.4, these two lenses are nearly identical. The 85 might have a very slight edge in the center of the frame, but overall, it is impressive how similar these two perform. Looking at the specs and measurements, the Sigma 105mm vs. 85mm f/1.4 DG HSM Art Lens comparison shows the 85mm option shedding considerable size and weight (39.9 vs. 57.9 oz, 1130 vs. 1640g). Again in this comparison, the 85mm lens weighing less means it does not need a tripod ring as much (it could still use one) and does not have one available (the Sigma lightens up to 53.7 oz (1520g) without its ring). The filter size difference is 105mm vs. 86mm in this comparison. The 85mm lens' price tag is considerably friendlier than the 105mm's price. When it comes down to decision time, I'm guessing the smaller size, lighter weight and lower price of the 85 Art are going to win the most votes. Canon, Nikon and Sony make great 85mm f/1.4 lenses that are worth consideration. 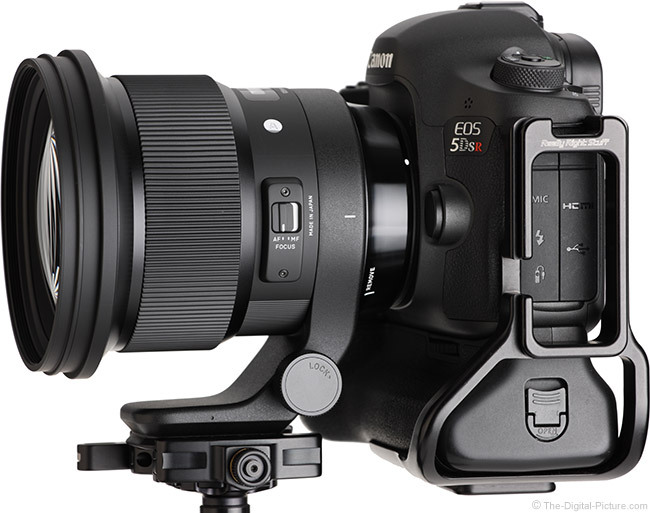 The alternatives section of the Sony review compares some of these options with the Sigma 85, which again, is quite similar to the Sigma 105. If an f/2 aperture is wide enough, the Canon EF 100mm f/2 USM Lens is an interesting option. This lens is a lower end option, but it is far smaller and less expensive. The Canon EF 135mm f/2L USM Lens is another interesting alternative. This lens has a narrower max aperture, but it adds 30mm to the focal length. In the Sigma vs. Canon 135mm image quality comparison at f/2, the Sigma rules. That rule diminishes as the aperture narrows until the two are mostly similar in sharpness at f/4. Starting with a wider aperture gives the Sigma a 1-stop peripheral shading advantage at f/2. Looking at the specs and measurements, the Sigma 105mm f/1.4 DG HSM Art Lens vs. Canon 135mm comparison shows the Canon weighing roughly 1/2 as much and much smaller in size. Similarly, the Canon uses 72mm filters vs. 105mm. The Canon wins the maximum magnification contest by a large margin (0.19x vs. 0.12x) and is compatible with Canon's 1.4x and 2x extenders. 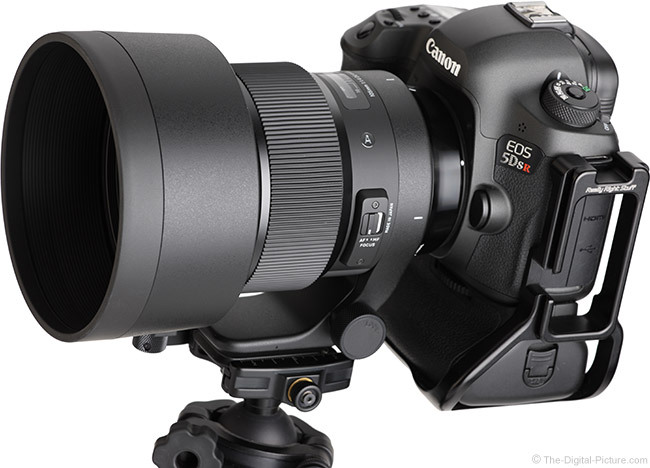 That the Canon costs far less is attention-garnering. Circling back to Sigma Art lens options ... the Sigma 135mm f/1.8 DG HSM Art Lens is worth comparing. Again, this lens is 30mm longer and has a 2/3-stop-narrower max aperture. In the Sigma 105mm vs. Sigma 135mm Art Lens image quality comparison at f/2 (the widest common tested aperture), I see these two lenses looking similarly impressive. The 135 might have a slight advantage in the corners, but again, a great performance is being turned in by both. Looking at the specs and measurements, the Sigma 105mm f/1.4 DG HSM Art Lens vs. Sigma 135mm f/1.8 DG HSM Art Lens comparison shows the 135 as the smaller and lighter lens. The 135's maximum magnification is much higher (0.20x vs. 0.12x) and its filter size is much smaller (82mm vs. 105mm). The 135 has a better price, but it is not dramatically lower. There are many additional lenses that can be compared to the 105 Art. Use the site's tools to create your own comparisons. The 105mm f/1.4 DG HSM Art Lens hits the streets as Sigma's longest focal length option in their ever-growing list of f/1.4 Art lenses (I'm already looking forward to the next one). All of these lenses are beautifully-designed, show no hint of cost cutting decisions being made and are high-performing, often optically best-in-class. The 105mm Art lens falls right into this description. There are very few lenses as sharp as this one at f/1.4. Having an f/1.4 aperture is extremely desirable. Use this aperture to gain a faster shutter speed useful for stopping low light action (including handheld camera motion) and/or lowering the ISO setting. Also, use f/1.4 for the shallow depth of field it can create, gaining a stronger background blur and making the subject pop from an otherwise distracting background. While no 105mm f/1.4 lens is going to rule the bokeh world, the Sigma-self-dubbed "Bokeh Master" does have the ability to create a very strong (and high quality) background blur at its very useful focal length. 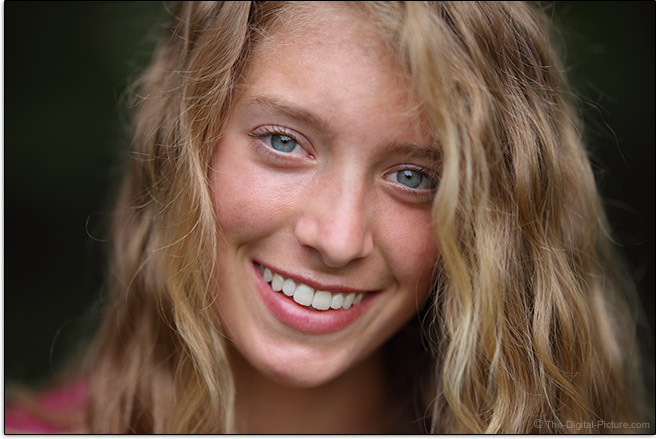 The 105mm focal length and f/1.4 aperture combination is especially superb for portraiture. This lens can solely handle many portrait sessions and potentially deliver results that will have the subjects' friends getting in line for their sessions. I experienced some inconsistent AF accuracy on my Canon 5Ds R test camera and while that is an issue, you may not encounter the same (results from the 1D X II were better) and I was able to work around that issue with little detriment. That this lens is not small or light may be viewed negatively by some, but I didn't find those attributes hindering. 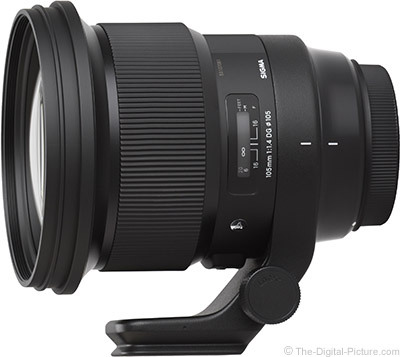 The price is not low, but it is not extravagant either, especially relative to some of the other options and that the Sigma's Art lenses deliver so much for the price is often the decision-making factor. Overall, the Sigma 105mm f/1.4 DG HSM Art Lens delivers at the high level that previous Art lenses have led us to expect. It's a sweet lens.